Somewhere in the world, there is a Rolls-Royce powered aircraft taking off every 16 seconds. Rolls-Royce is enhancing our role in empowering the aviation industry to be more sustainable in both profits and carbon emissions. We believe the answer lies in data. How might we leverage data for better decision-making in, for instance, flight scheduling, flight planning, and maintenance scheduling? What new use cases might emerge from sharing, merging and interpreting data to unlock business value? 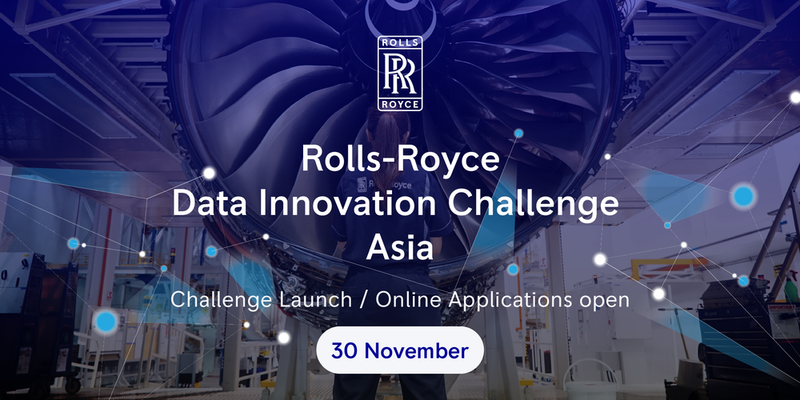 At the inaugural Rolls-Royce Data Innovation Challenge Asia, we are providing 12 months’ worth of flight and environment data for you to design the “perfect flight”. Whether you are a startup with strong data and AI capabilities or a data enthusiast, we want you to participate and help solve some of the aviation industry’s biggest challenges. Shortlisted teams will get the opportunity to work with Rolls-Royce domain experts to enhance their solutions, and stand a chance to win the top prize of USD10,000! At the Launch event, you will get to hear from the Adrian Man, Head of Ecosystems and Partnerships, Rolls-Royce on the innovation and commercial opportunities that is emerging from unlocking aviation industry data, and how you can get involved. Meet the team from Rolls-Royce’s R² Data Labs, who will also explain the challenge and the datasets. How might we optimise flight schedules that takes into consideration factors such as weather and congestion? How might we track engine usage through mileage and aircraft circling (due to destination airport congestion, for example) for better predictive maintenance? Could we monitor and adjust flight plans or fuel burn on the fly due to prevailing or forward (predicted) conditions near or at the destination airport? For data and tech companies that collect or have access to other flight-related datasets, what new use cases can you develop by mashing up datasets?